Amish roofing contractors provide services throughout the Buckeye State, including roof repair, re-roofing, new roof installation, shingle repair and replacement, metal roofing, and more. Check the directory below to find an Amish roofer in Ohio. Please note: Many of the following companies are Amish-owned and operated. Some are owned by non-Amish roofing contractors who employ Amish workers. Policies and services may change, please double-check with the roofer for current information and details on getting a roofing estimate. View the main directory of Amish roofers including companies in states such as PA and IN. Quite a few Amish roofing contractors provide services in the greater Cleveland area, including Lake and Cuyahoga Counties. Ohio’s second biggest Amish population is centered in nearby Geauga County, home to a number of Amish roofers. Hershberger Roofing & Siding is an Amish-owned and operated business, and has been providing roofing services for the past 10 years. Amish craftsmen perform high quality work including roof installation, roof repair, roof inspections, as well as energy-efficient and eco-friendly roofing solutions. Roofs can be customized to fit any specifications. This company provides a broad range of services including home remodeling, residential roofing, commercial roofing and more. Amish-owned Kline Roofing offers complete roofing services including new roofing, roof restoration, roof repair after wind and hail damage, siding, windows, gutter, gutter guards and other exterior products. This business employs experienced Amish workers on its crews. Fully insured. Non-Amish company employing Amish roofers. Does work in the following areas: Lake, Cuyahoga, Geauga, and Ashtabula County. The Holmes County Amish community is home to numerous Amish construction companies, including roofing contractors. Amish in this community and others in central Ohio provide roofing services in the greater Columbus area. 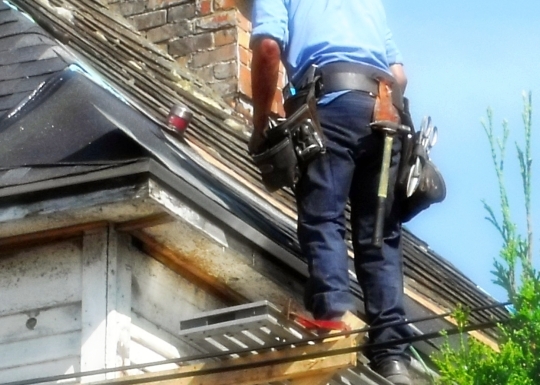 Charm Builders specializes in re-roofing; also installs new roofs, siding, windows and guttering. Amish roofing crews perform solid constructions work to fit any specifications using high-quality materials. Home waterproofing and weatherizing. Carries indoor and outdoor products including furniture, cabins, play sets and storage buildings. Also provides re-roofing and re-siding services. All work is done by William Wengerd of Wegerd Homes located out of Fredericktown. While the larger Amish settlements are located in other regions of the state, some Amish roofing companies do service the greater Cincinnati area. Some Amish roofers servicing Cincinnati and southern Ohio may in fact be located in neighboring states such as Kentucky and Indiana. Insured Amish construction company doing new roofing, siding, decks, gutters, and more, along with interior work. New residential roof can be installed within two weeks. Are there roofers near Hillsboro, Ohio? We would like to get an estimate for a metal roof on a house off of 138 between Hillsboro and Greenfield. This is the house my mother lives in. I live in Indiana and have 2 sisters in Columbus. Please let us know if there are any roofers in the area. We have heard good things about Amish workmanship and pricing. Need to demolish old 7 bay garage and replace with new 4 1/2 bay garage/storage facility in Marietta, Ohio. Are there any Amish work crews in this area interested and qualified for this project? I am looking for someone to give me an estimate on the cost of building a small home (1173 square feet) in Cutler, OH. I need a roofer to lay 7/16 Osb , and metal barn material. We are a distributor of reflective insulation used in roofing and under siding and is very cost effective and comes with a full 20 yr warranty. Our warehouse is centrally located in ohio for quick on time delivery ( in stock items ). Please call John for pricing and availability. Liz, you need to contact the people you worked with directly. This is just a business directory page. Your message won’t get to them unless you call them yourself. I am trying to find out if there are any groups working in the Southern Ohio Area. The farthest south I have found is Laurelville. I am in the West Portsmouth area and need a house with shingles re-roofed with metal panels. Any help would be greatly appreciated. Thank you. Ani, you’re in a less-Amish part of Ohio, but there are some Amish not too far away. This is the only contact I have for your general area, they are about an hour north of you in Kingston area. We are private home owners that purchased a 1935 farm home in Boliar, ohio. We would like to contract your company to install a steel roof. Possibly and full home makeover. We will be filming the makeover with a professional company. Would you be interested in this marketing opportunity? This home will need to be evaluated for structural soundness. I am looking for roofers in the Findlay, Ohio area. I hope you can help. Any Amish Roofers in Dayton? I have a house in Dayton that needs a new roof. Are there any Amish roofers that can do this? Did you get a reply to your question? Need teardown and rebuild approx 1500 square Ft roof, single story near Malta Ohio. Slate. Possibly three other related roofing projects depending on price and availability.I can do the slate if I have to, but I can’t build the structure. Thanks. Need metal roof and siding or hemlock siding. Need a metal roof for an addition on a house in Boardman Ohio. Need done by fall. Not a large job, looking for estimates. I need contractors for multiple projects on a residential property in Chesterland, OH, including a gable dormer, a room addition and a barn roof repair. A friend living in the Toledo Ohio area told me they had their roof replaced several years ago by your Amish Roofers. She can not find the contact information. She told me to just Google Amish Roofers but I am having problems finding Amish Roofers in Toledo NorthWest Ohio area. I am currently looking to have my house roof replaced. Chestnut Oak Construction is a Amish Pre-Engineered Metal building Erector/ Rough Carpentry/ Metal Roofing/ Steel Erector We are located in the Dayton Area but cover most of Central OH. Elite crew of Old Order Amish Craftsman and “english” business owners. Several years experience. Conklin Roofing Systems Master Contractors. Commercial jobs of 100,000+ sq to residential jobs. Check out our webpage or find us on Fb at Elite Commercial Roofing & Construction or call us.. 740-245-2436. Hi. I need the slate repaired in a couple spots on my 150 year old original roof on my home. Also flashing around chimney and pipe vent etc. I live in LODI . Ohio 2 miles from I.71 and 1 mile from 224..thank you.. I recently took a trip to a south American country to do ministry work. As I was there, I drove into a totally different area run by a group of Amish. The quality of even the grounds upkeep was impeccable. Seeing their attention to detail and craftsmanship has given me “new eyes” and I admire them for it. Keep up the great work.